Arguably the most famous game reserve in all of Africa, Kruger National Park is a vast tract of land covering some 19,633 square kilometers/7,580 square miles in the northeast corner of South Africa. It spans the Limpopo and Mpumalanga provinces, and runs along the national border with Mozambique. 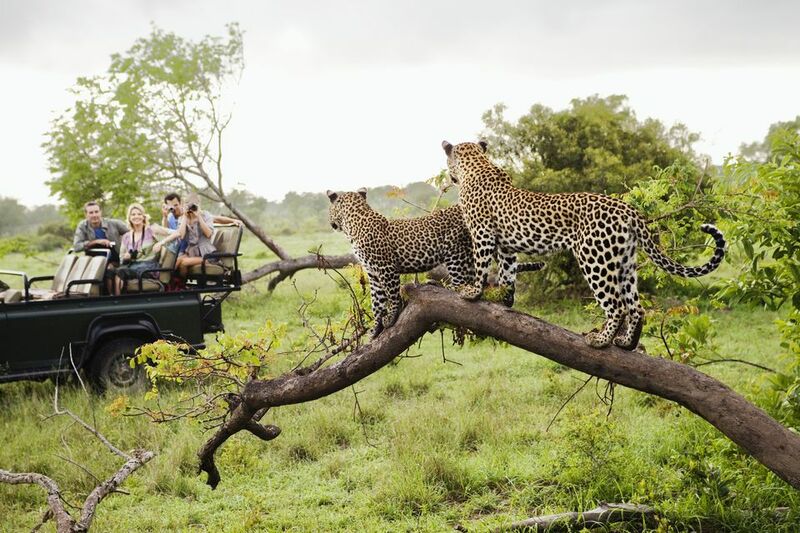 It is the ultimate safari destination for visitors to South Africa, offering day visits, overnight stays, self-drive safaris and guided game drives. Kruger National Park was first established as a wildlife refuge in 1898, when it was proclaimed as the Sabie Game Reserve by the president of the Transvaal Republic, Paul Kruger. In 1926, the passing of the National Parks Act led to the merging of the Kruger with nearby Shingwedzi Game Reserve, creating South Africa’s very first national park. More recently, the Kruger became part of the Greater Limpopo Transfrontier Park, an international collaboration that joins the park with the Limpopo National Park in Mozambique; and the Gonarezhou National Park in Zimbabwe. As a result, animals can now move freely across international borders as they would once have done thousands of years ago. The park’s incredible size means that it spans a number of different eco-zones, including savannah, thornveld and woodland. This diversity creates the ideal habitat for an astounding variety of flora and fauna. 147 mammal species have been recorded within the park’s boundaries, in addition to countless reptiles, fish and amphibians. Amongst them are the Big Five - buffalo, elephant, lion, leopard and rhino (both black and white). The Little Five are also present in the Kruger; while other top spots include the cheetah, the Sharpe’s grysbok and the endangered African wild dog. The best time to spot wildlife is in the early morning or late afternoon, with guided night drives providing a unique opportunity to look for nocturnal species. In terms of flora, the Kruger is home to some of Africa’s most iconic trees, ranging from the majestic baobab to the indigenous marula. Many visitors are also drawn to the Kruger by its impressive birdlife. The park is home to no fewer than 507 avian species, including the Birding Big Six (the ground hornbill, the kori bustard, the lappet-faced vulture, the martial eagle, the saddle-billed stork and the Pel’s fishing owl). It is also known for its amazing variety of raptors; and in particular, for its eagles, which range from the colorful bateleur eagle to the magnificent tawny eagle. The park’s waterholes, rivers and dams are especially rewarding places for birders. In addition, many birds are attracted to the public picnic sites and rest camps. If birding is a priority, plan to stay at one of the more remote bushveld camps, all of which have viewing platforms or hides and a list of resident specials. The vast majority of people visit the Kruger to go on safari. You can drive your own car along the well-maintained tarred and gravel roads; or book a guided game drive through any of the rest camps. Options for the latter include drives in the early morning, late afternoon and at night. One of the best ways to experience the park in all its beauty is on foot, either with a guided walk at the camps, or on one of the multi-day Wilderness Trails. Four-by-four enthusiasts can test their vehicles (and their mettle) on the park’s off-road trails, while mountain biking is offered at Olifants camp. Golfers can even tee off at Skukuza Golf Course, whose un-fenced green is frequently visited by hippo, impala and warthog. Kruger also has a fascinating human history, with evidence of people and their prehistoric ancestors living in the region for up to 500,000 years. More than 300 Stone Age archaeological sites have been discovered within the park, while other sites relating to the area’s Iron Age and San occupants also exist. In particular, the Kruger is known for its San rock art sites, of which there are approximately 130 on record. Sites of particular anthropogenic interest include the Albasini Ruins (the remains of a 19th-century Portuguese trading route), and the Iron Age settlements at Masorini and Thulamela. Accommodation in Kruger National Park ranges from campsites for tents and caravans to self-catering cottages, multi-room guesthouses and luxurious lodges. There are 12 main rest camps, all of which offer electricity, a shop, a petrol station, laundry facilities and a restaurant or self-service café. Four of these main camps also have their own satellite camps. For a quieter stay, book a cottage at one of the park’s five bushveld camps. These are restricted to overnight guests, and have fewer facilities in addition to a unique feeling of remoteness. Bedding and a daily cleaning service are provided at all SANParks camps and lodges, while cooking utensils and refrigeration are offered at most. There are also 10 private lodges located on concessions within the park. These are 5-star, ultra-luxurious options for those that want to combine days spent game-viewing with gourmet meals, spa facilities and impeccable service. Whatever accommodation option you choose, booking in advance is essential and can be done online. The Kruger has a semi-tropical climate defined by hot, humid summers and warm, mild winters. The majority of the park’s annual precipitation occurs during the summer rainy season (typically from October to March). At this time, the park is lush and beautiful, birdlife is at its best and prices are at their lowest. However, the increased foliage can make game harder to spot, while the abundance of available water means animals are no longer forced to congregate at the waterholes. Therefore, the drier winter months are traditionally considered the best for game-viewing. Be aware that in winter, nights can get chilly - make sure to pack accordingly. It’s also important to know that Kruger National Park lies within a malarial area, although the risk of contracting the disease is generally considered to be low. Many people opt to minimize the chance of infection by reducing the likelihood of being bitten (malaria is carried by mosquitoes). This means wearing long sleeves and pants after dusk, sleeping under a mosquito net and applying repellent liberally. The best way to avoid contracting malaria, however, is to take an anti-malaria prophylactic. There are three different kinds that can be used in the Kruger, all of which vary in terms of price and side effects. Ask your doctor which is the best option for you. The Kruger is easily accessible via road for self-drive guests, with tarred roads leading to all nine entrance gates. Make sure to leave plenty of time when planning your journey, as all gates close at night (although late entry may be permitted for a fee). Overseas visitors generally choose to fly into Johannesburg, and then catch a connecting flight to one of four airports. Of these, only Skukuza Airport is located within the park itself, while Phalaborwa Airport, Hoedspruit Airport and the Kruger/ Mpumalanga International Airport (KMIA) are situated close to its boundaries. Daily flights also exist between Cape Town and Skukuza, Hoedspruit and KMIA airports; while visitors from Durban can fly directly to KMIA. Upon arrival at any of these airports, you can hire a rental car to take you to (and around) the park. Alternatively, some private bus companies organize shuttles between the airports and the park, while those on a packaged tour will likely have their transport taken care of for them. Children are charged as adults from the age of 12. For accommodation rates and prices of individual activities (including Wilderness Trails, mountain bike safaris and guided game drives) check the SANParks website.